Today's armed forces require flexible and cost effective means of deploying rapidly their manpower and resources. This need was reflected in a joint European Staff Requirement that was endorsed in 1997 by eight European nations, all of them members of NATO. Following an assessment of a number of proposals to meet this requirement, the nations announced on 27 July 2000 that their choice was in favour of the Airbus A400M proposal. A400M is a new design tailored to meet the customers needs, and is at the forefront of developments in new technology for a large transport aircraft. The aircraft also offers the possibility of greater interoperability, as well as multi-national training and support packages with the potential to offer major through-life savings. The programme breaks new ground in European collaborative procurement with the adoption of a more commercial approach towards its acquisition and support. The programme has been officially launched and integrated into OCCAR in May 2003. The current intention of the Participating States is to procure a total of 170 aircraft made up as follows: Germany 53, France 50, Spain 27, Turkey 10, UK 22, Belgium 7, Luxembourg 1 (Luxembourg is represented by Belgium within the OCCAR A400M Programme). The delivery schedule extends to 2024. An SLA was signed between OCCAR and the NSPA already in 2014 to benefit from NSPA’s logistic support capabilities in accordance with the Aerospace and Defense Specification 2000M (ASD S2000M). The fourth amendment recently signed NSPA provides an extension of the services for another 3 years (2019-2021). 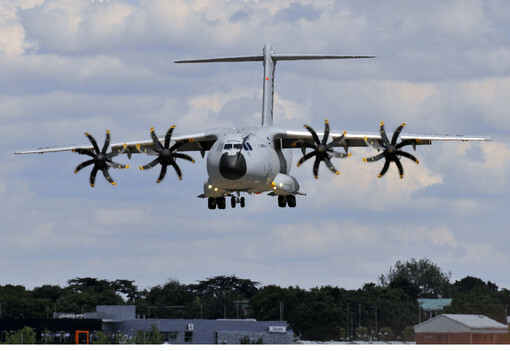 Airbus has for the first time formally delivered two A400M new generation airlifters to two different nations in one day. The company handed over the aircraft on 20 March to the European Organisation for Joint Armament Cooperation (OCCAR), in charge of the management of the A400M Programme, representing Germany and France – at a ceremony in Seville, Spain. The Spanish MoD has tasked OCCAR-EA to contract the full integration of the DIRCM (Directed Infrared Counter measures) solution on their A400M fleet. On the 16th of November 2016 OCCAR signed the Aircraft Transfer of Title (ToT) for MSN44 (Manufacturer Serial Number 44) signifying the 1st A400M delivery for Spain, out of a total fleet of 27 Aircraft, and the achievement of Spanish Entry Into Service (EIS). For further information about the A400M Programme, please contact the Programme Division or the Prime Contractor.